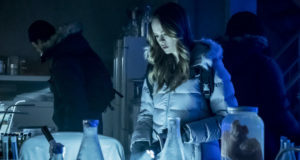 Caitlin Snow seems to be on a “Killer Frost” trejactory — heck, the seventh episode of the current season of The Flash, directed by Kevin Smith, is called “Killer Frost.” We spoke with actress Danielle Panabaker on the 100th episode “green carpet” for Arrow, and she revealed that she, too, is as excited as we are. 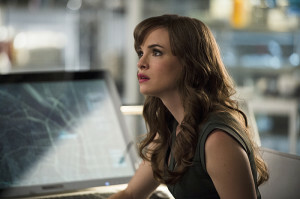 “I think Episode 7 is going to be a fantastic episode, and I’m really excited for fans to see it,” Panabaker said. That’s not the only good news coming for fans of the Caitlin character — in the November 1 episode “Monster” we finally meet Caitlin’s mother, Dr. Tannhauser, as played by Susan Walters. 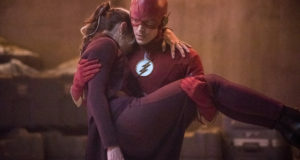 The Flash is new Tuesdays at 8PM on the CW; be sure to follow @GreenArrowTV on Twitter for updates as more Arrow Episode 100 interviews are posted! Our thanks to Danielle for speaking with us the other night!